Yesterday we had a lab experiment in the university lab facilities, specifically the small reverberant chamber; this lab was the creation and measurement of room modes. In acoustics, everything has a frequency that it naturally vibrates at, like a guitar string or the air in a bottle when you blow across it; well the same is the same for a room. If a loudspeaker is placed in a room and the frequency is found where the wavelength of the sound wave (produced from the loudspeaker) is the same as (or an integer multiple of) that of the dimensions for the room, then what is known as a standing wave is set up. This is where when the wave is reflected between the two walls and it does not move or emit any energy but instead creates ‘nodes’ and ‘antinodes’ which are pressure minimum and maximum points respectively. As this wave is set up, the wave from the speaker interacts with the wave reflected from the wall which causes the equal and opposite signals to cancel each other out at nodes and or vice versa and double at anti nodes. A graphic representation is given in the diagram below. As the frequency is doubled, double the number of half wavelengths are set up between the walls, as is shown in the diagram also. You may not notice room modes often in everyday scenarios as spaces are often acoustically designed to avoid them. Use of absorption (as mentioned in one of my previous posts) reduces reverberation and thus the reflected signal and room mode. We carried out this experiment in the reverberant chamber because of this, so that they would be easily set up. 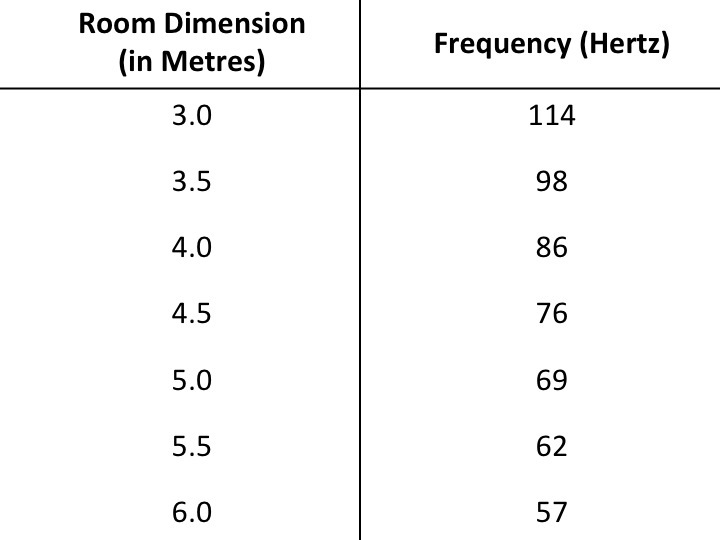 Rooms with matching axis dimensions or integer multiple dimensions (e.g. a cube or a room 2m x 4m x 8m) are a bad idea as this means that at one frequency all room modes are going to resonate and will become more prominent as a result; in this case 4x louder than in just 1 dimension. The video shows how the frequency starts loud at 1 wall then reduces in the middle and gets louder at the other wall; this is the effect of the room mode. You may have expected, if the theory is true, that there would be no sound in the middle, however this is not the case because of sound waves propagating in the other axes as the room was not cubic. You may find it hard to hear on your speakers (but with footsteps and speech being more audible); this is because I shot this video on my iPhone 5. The graph below shows the frequency response for an iPhone microphone where 0dB on the y axis means that the mic picks up the input signal at the same level it is heard, with below this being picked up less and it being amplified greater than it is above 0dB. You will see that it is mainly amplified at mid/high frequencies because this is roughly the frequency of speech, the main requirement for a phone microphone! Low frequencies are reduced because they are not needed so much (e.g. to reduce that annoying wind howl in the background as you are trying to make a phone call). This is why you cannot hear it very clearly in the recording, even though in reality the speaker was producing up to 100dB, which is why we needed to wear ear defenders. It was an interesting concept to experience, but one I recommend; if you have a spare few minutes and have a reasonably good set of speakers, try out this Tone Generator and try and find the resonant frequency of the dimensions of the room. Note that there will be a different mode set up for each different dimension in the room. Once you find a frequency you seem to think may be resonant, then have a walk round and listen for how the sound varies at different points in the room, then comment below and let me know what you heard!